The police continued with a recent trend last night: breaking up protests before they even get to start. Around 300 people set out from Parc Émilie Gamelin Friday night for a demonstration meant to mark the one-year anniversary of the massive March 22 student protest last spring. Service de police de la Ville de Montréal officers in riot gear kettled protesters at the intersection of de Maisonneuve Blvd. and St. Timothée St., announcing the protest had been terminated. This was just 30 minutes after the demonstration had begun, with failure to submit an itinerary as required by bylaw P-6 cited as reason for police intervention. Riot squads then performed sweeps of adjacent roads, corralling those on the street to be processed and fined. Meanwhile, about 100 people were trapped in two kettles—many for over two hours. Police processed the detainees on Société de transport de Montréal busses and and sealed off the kettle area with orange tape. A few dozen officers then drove back to Parc Émilie Gamelin and performed a sweep, dispersing those at the park. Around 7:40 p.m., protesters began to be released from the kettle area, after being fined $637 each for violating bylaw P-6. One of the first protesters to be released, Richard Renshaw told The Link that he had been shaken by his ordeal. “It has an impact […] it gives you a bad taste in your mouth,” he said. Around 8 p.m., between 10 and 20 people began chanting protest slogans near the corner of de Maisonneuve Blvd. and Wolfe St., prompting police to charge the area. One member told Link reporters that her friend had been pushed to the ground and tripped over by a police officer, then taken away. At 9:40 p.m., the SPVM announced they had arrested over 200 people. 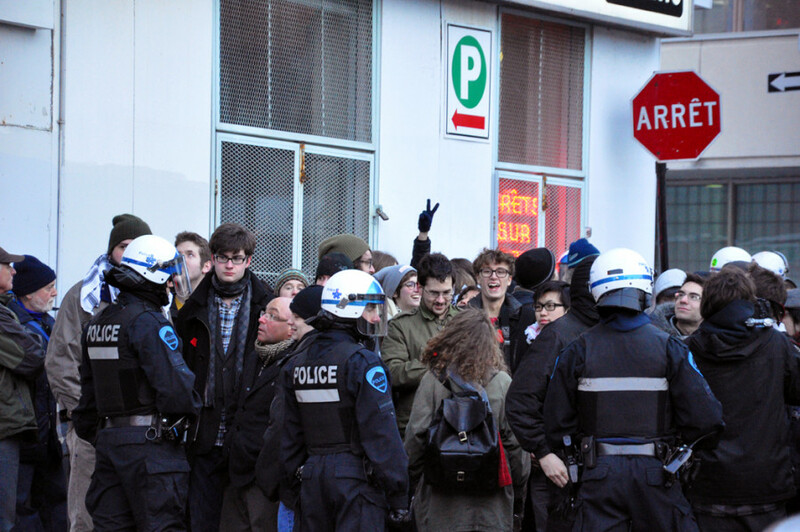 Although Law 12 was abolished by the Parti Québécois in September, the kettling and mass arrests seen at recent demonstrations rival some of the most tense days of the student conflict. The demo was also meant to highlight student discontent with the PQ government, which Cossette says has betrayed students by raising tuition and cutting social programs. “We’ve realized now that the PQ appropriated the [student] movement for electoral gain, in order to present itself as being of the people,” Cossette said. Go to our photo blog for more pictures from the demo.